As the sun begins to set on 2015, it calls for reflection. It’s impossible to contemplate the highs of 2015 — Feminism made its mark! Ronda Rousey trained in a Pikachu costume! More trans representation! Taraji P. Henson birthed Cookie Lyon and subsequently gave us life! — without thinking about the lows — Teens were shot and killed because of the colour of their skin, Donald Trump, “Wicked City” and mass shootings still manage to permeate our society. But there was one overwhelmingly positive trend that penetrated the zeitgeist this year: people took control of their own narratives. Women in Hollywood fought back against egregious sexism. The Black Lives Matter movement took to the streets to make their voices heard. Trans activists spoke out for more representation. Celebrities like Kylie Jenner and Taylor Swift controlled the message themselves. And this powerful trend isn’t fading into oblivion any time soon. Instead, more people will find, and use, their voices in 2016. Women in Hollywood will continue to speak up. This past year, actresses like Jennifer Lawrence, Emma Watson and Meryl Streep kicked the proverbial elephant out of the room and spoke out about the glaring gender inequality in Hollywood. So don’t expect words like feminism and gender pay gap to vanish from the pop culture vernacular in 2016. Peak TV isn’t going away anytime soon. We’re in the Era of Peak TV, which simply means that there’s just too much good TV available to us these days, and that’s not going to change anytime soon. In 2015, over 400 shows graced our television screens, laptops and smartphones. Didn’t have time to binge-watch “Narcos?” What about USA’s critically acclaimed “Mr. Robot?” Missed the last few episodes of “Fargo?” You still haven’t watched “Outlander?” (For shame.) Keeping up with today’s television schedule is like a full-time job, and unless you have 40 hours a week to dedicate to binge-watching, then you’re most likely going to be playing catch up in 2016. And that’s OK. In fact, in the Era of Peak TV, it’s completely normal. Big-budget franchise reboots and long-awaited sequels will never go out of style. One of the more lucrative ways for studios to make a lot of money, especially overseas, is to reboot beloved classics and green light long-awaited sequels. In 2015, “Jurassic World” crushed the box office, domestically and globally. (Well, before “Star Wars: The Force Awakens” swooped in and stole its record-breaking title.) “Creed” breathed new life into a tired, old Rocky Balboa, and “Mad Max: Fury Road” became the heart-pounding critical hit no one saw coming. Next year, “Independence Day: Resurgence” will drop, hoping to capitalize on our collective nostalgia for Jeff Goldblum and thirsty aliens. Paul Feig’s “Ghostbusters” — starring Kristen Wiig, Melissa McCarthy, Kate McKinnon and Leslie Jones — will put a fresh (and hella funny) spin on an ’80s classic, while Dwayne “The Rock” Johnson, along with Zac Efron, will bring “Baywatch” to the big screen. Thirteen years after “Finding Nemo,” Pixar’s “Finding Dory” will just keep swimming with its lovable forgetful fish this June, followed by the September release of “Bridget Jones’s Baby.” Oh, and the really, really, ridiculously good looking “Zoolander 2″ hits theaters in February. So… prepare to be inundated with familiar franchises. “Star Wars: Rogue One” will shatter more records (probably). “Star Wars: The Force Awakens” became the quickest film to earn $1 billion worldwide in movie history, and while it’s unlikely that standalone feature “Rogue One” will be able to capture that same magic, never put it past the Force to make history. Directed by “Godzilla” helmer Gareth Edwards and starring Felicity Jones, “Rogue One” is a prequel that takes place just before “A New Hope” and follows the rebel quest to steal plans for the Death Star. #OscarsSoWhite will still be an issue. While there continues to be a push for diversity on the small screen, thanks in part to the wild success of Fox’s “Empire,” Hollywood still has a major diversity problem. Last year, Black Twitter created the hashtag #OscarsSoWhite in response to the glaring lack of diversity in actor nominees. Of the 20 main acting categories, not a single person of color was nominated. Of course, lack of diversity in nominations has long been the status quo — white men have dominated Hollywood since its inception, after all — but the whitewashed nominations are even more jarring when you see talented people like David Oyelowo and Ava DuVernay being left out. This February, the Oscars won’t fair much better — that is, if THR’s annual actor roundtable issue is any indication. For its 2016 award season preview, THR chose eight actresses, all blindingly white, for the roundtable conversation and cover shoot. It was so egregiously white that editor Stephen Galloway issued a preemptive apology on behalf of the entire film industry. Of course, “For Your Consideration” season isn’t over, and some last-minute Oscar campaigns could reach voters in time. (Recently, Caitlyn Jenner has been campaigning for trans actress Mya Taylor to score a supporting actress nom for “Tangerine.”) Judging from the Golden Globe nominees, however, #OscarsSoWhite will undoubtedly be a problem for this year’s telecast. There’s no such thing as too much of a good thing, at least when it comes to diversifying our media. Hollywood remains eons behind the ethnographic makeup of the U.S., but on our television screens, things are getting better. When Lee Daniels and Danny Strong’s “Empire” premiered on Fox in January, it shattered records and became the only show in the history of television to grow its audience numbers and ratings for 12 consecutive weeks. It was unprecedented. After the success of “Empire,” as well as smaller successes with ABC’s “Fresh Off the Boat,” “How to Get Away With Murder,” and “Black-ish,” media trades started calling TV diversity a growing “trend.” But featuring more people of color on our television screens is more than a trend; it’s the new normal. Finally, TV executives are actually paying attention to their audiences — and it’s going to have a huge impact on 2016’s fall TV pilots. We will continue to talk about “Harry Potter” every single day. Is there a day that goes by when you don’t reference “Harry Potter” in some way, shape or form? No? Good. Because 2016 is shaping up to be a magical year for fans of J.K. Rowling’s wizarding world. Back in September, Rowling crowned this new era the “Age of Hufflepuff,” thanks to Newt Scamander, the author of “Fantastic Beasts and Where to Find Them.” He’ll be making his way to the big screen in November 2016 in the forthcoming film of the same name, starring spell-binding wood nymph Eddie Redmayne. But if you can’t wait that long for more HP, “Harry Potter and the Cursed Child,” the official eighth installment of the “Harry Potter” saga, will premiere in London’s West End in July. What if Harry’s son Albus Severus Potter is — gasp — a Hufflepuff? Age of Hufflepuff, indeed. “Hamilton” will continue to rise up. For a show obsessed with the idea of leaving a legacy, it’s fitting that “Hamilton” has changed the game in so many ways. Broadway’s hottest ticket is a musical about Alexander Hamilton, America’s “ten dollar founding father without a father,” and his life and political career from the American Revolution until his death in 1804 at the hands of his career nemesis Aaron Burr. Created by Lin-Manuel Miranda, literal genius, “Hamilton” is a story about the American dream in its purest form, both in what it takes to get there and what it can cost you at the end. “Hamilton” has spawned one of the most creative and fervently impassioned fandoms in recent memory, and they’re not slowing down any time soon. Expect even more “Hamilton” memes in 2016, especially as the political race heats up. Superheroes will inherit the earth. No, really. At this point, caped crusaders are an ubiquitous part of our culture. 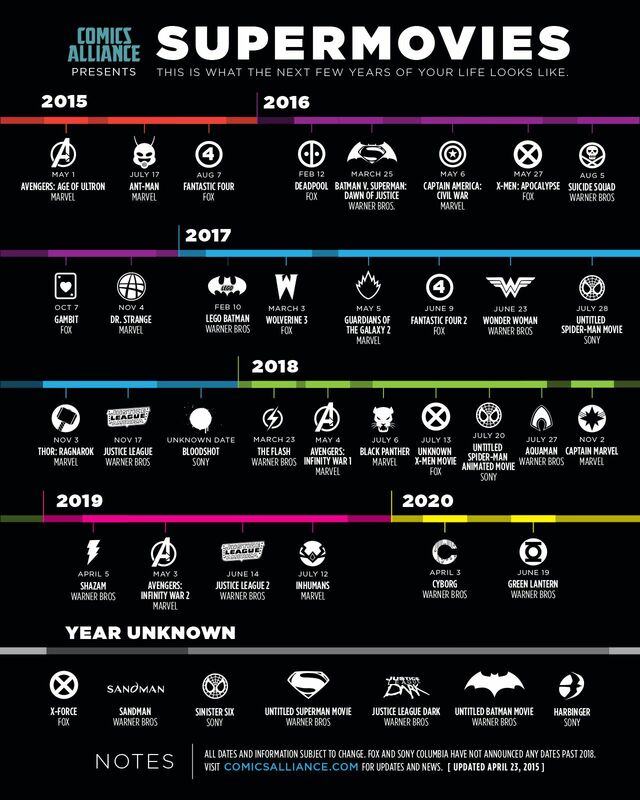 Over the next five years, studios will produce 30 superhero films. Needless to say, Hollywood is really committed to making this superhero thing stick. In 2015, “Avengers: Age Of Ultron” crushed the competition at the box office but failed to win over critics. Meanwhile, Marvel’s “Ant-Man” — arguably, the studio’s smallest story to date — had a relatively soft opening at the domestic box office, despite its rave reviews. And then there was “Fantastic Four,” the heavily maligned big-budget franchise reboot that failed (tremendously) to live up to the hype. So, no, it wasn’t a great year for superheroes on the big screen, but on the small screen, the genre flew to new, exciting heights. Shows like “The Flash,” “Supergirl,” “Marvel’s Jessica Jones,” “Daredevil” and even “Gotham” lived up to the superhero-sized hype and produced some of the most emotional and nuanced performances on TV. The new year, however, will be a fresh slate for the superhero genre. Some of the biggest, most-hyped franchise releases will be released in 2016, including “Batman v Superman: Dawn of Justice,” “Captain America: Civil War,” “Doctor Strange” and “Suicide Squad.” Marvel’s “Luke Cage” will also premiere on Netflix, as well as the second season of “Daredevil.” Can you hear the sound of the Joker destroying your sanity? Because it’s happening. For better or for worse, 2015 was the year we realized that everything old can and will be made new again. This year in pop culture, nostalgia reigned. When casts from our favorite TV shows got together and ~ reunited ~ IRL, we put on our rose-tinted glasses and it became headline news. We don’t know what dark magic was behind it, but we’ll take it — and thanks to the beauty of social media, this trend will continue well into 2016. King Kylie is still our Insta overlord. Who run the world? The Kardashians, she said, as if it were the most obvious thing ever. Well, more specifically, Kylie Jenner. We know she’s not technically a Kardashian, but she’s undoubtedly cut from the same Margiela cloth. In 2015, King Kylie stole the Kardashian krown from her half-sister Kim, and she hasn’t looked back. Kylie, now 18, is a tabloid tour de force and the kween of controversy. No matter how hard we tried to forget, we still know about Tyga’s existence. We even know that his name is a backronym for “Thank You God Always.” Not to mention, the youngest Kardashian is also a budding entrepreneur. Kylie, like her sisters Kim, Khloe, and Kourtney, knows how to monetize her best assets. Enter the Kylie Jenner lip kits: three shades of matte lipstick and lip liner sets that promised to give ravenous consumers that plump glow. Her lifestyle app also outranks her sisters’, proving that our insatiable thirst to keep up with Kylie is never-ending. Trans actors will take center stage. At the beginning of 2015, Laverne Cox was the face of the trans movement in Hollywood. Now, thanks to a landmark year for transgender representation and inclusion in media, Cox isn’t the only recognizable face anymore. Jamie Clayton starred in Netflix’s original sci-fi drama “Sense8,” created by Lana and Andy Wachowski, and turned out one of the year’s most understated and nuanced performances. Meanwhile, Mya Taylor made waves this summer in “Tangerine,” a heartfelt comedy that follows two transgender prostitutes as they track down a cheating pimp on Christmas Eve. While it’s clear that opportunities are exploding for actors like Cox, Clayton, Taylor, Hari Nef (“Transparent”), Alexandra Billings (“Transparent”), Tom Phelan (“The Fosters”) and Candis Cayne (“Elementary”), Hollywood still has a long way to go when it comes to trans representation. Director Tom Hooper was criticized for casting Eddie Redmayne, a cisgender man, in the role of trans pioneer Lili Elbe. Trans lives should be reflected on the large and small screens, and trans performers should be hired to portray them or other, cisgender roles. Hopefully, with the growing visibility of trans actors in Hollywood, we’ll see less of this in 2016. Disney Princess reimaginings will never get old. Or, at least, that’s what you’ll tell yourself to mask the pain. It seems like the Internet produces a new Disney reimagining on a daily basis. Just this summer alone, we’ve seen Disney princess with fins, short hair, realistic body hair, pin-up tattoos, without makeup, as Marvel superheroes, creepy clowns and and so on and so forth. Will this madness ever end?! No. No it will not.